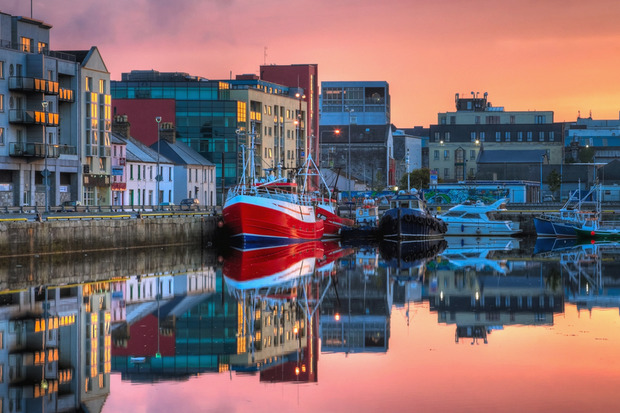 Morning view of Galway's docks. Have you ever stolen a kiss under the Spanish Arch? Or shared an ice-cream on the Salthill Promenade? It could be time to add these to your Valentine's Day to-do list, because Galway has been voted the top spot in Ireland for a dance with romance. Scooping over 20pc of the votes in a 'Love-o-meter' poll by confectionary brand Swizzels Love Hearts, the City of Tribes beat runner-ups Dublin (18pc) and Kerry (14pc) to the top spot. Cork and Kilkenny helped fill up the top five. And, judging by people's top preference of Valentine's gift, it could be an idea to book a weekend away in romantic Galway. According to the survey, a massive nine out of 10 people will be splashing the cash for Valentine's Day... and the majority of those are hoping for a weekend break away. If you are visiting the west, keep in mind the bustling Eyre Square for a wander, Galway Cathedral for an impressive history lesson and the Salthill Promenade to blow those cobwebs away. Fear not if a weekend away is not an option this February 14. A romantic meal for two came in second place on the 'Ideal Gifts' list, while an unprompted declaration of love came in third.